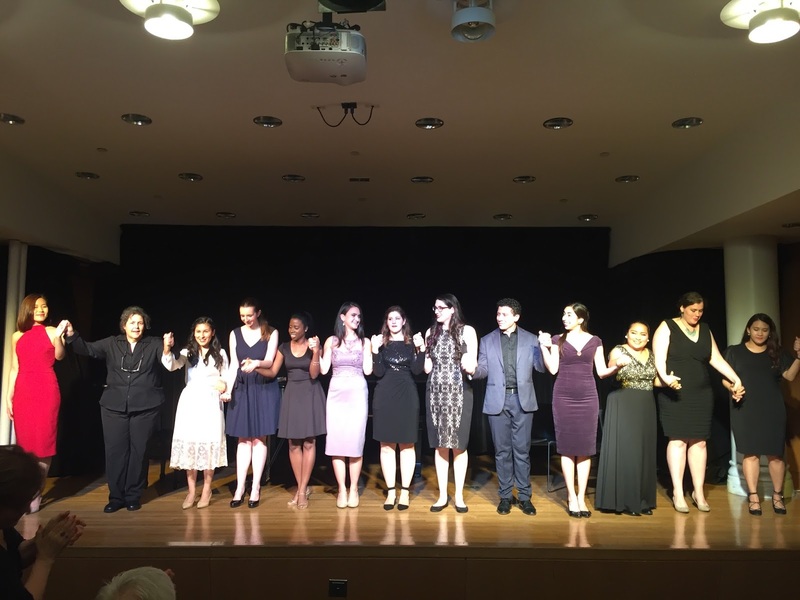 The International Vocal Arts Institute has been helping young singers bridge the gap between studies and professionalism for thirty years, under the guidance of Founder /Artistic Director Joan Dornemann and Music Director Paul Nadler. We just caught up with them last year and was sufficiently impressed that we blocked out as much time as possible to attend their events this year. IVAI holds these institutes in Asia, Latin America, and Canada. This year's institute drew 80 young singers from 16 countries. 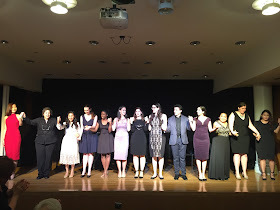 It is only one week into the program in residence at Mannes School of Music at the New School. With nearly two weeks left, the young artists are already showing the signs of some excellent coaching, witnessed by the fact that they all had good command of both Italian and Spanish and some good legato technique. The composition of the group of singers on tonight's program was varied from undergraduate level to singers who have been singing professionally. In the latter category was Banlingyu Ban, a highly gifted soprano from Shanghai who dazzled us recently in her performance as Cio-Cio San with Heartbeat Opera (review archived). She performed the lovely Verdi song "In solitaria stanza" and we are pleased to report that her appealing stage presence lost nothing by moving from opera stage to recital stage. Her tone is lovely with a special quality in the upper register and she invested the song with convincing passion as the poet laments his very sick beloved Irene. Her Spanish was equally memorable in a couple of songs from Manuel de Falla's Siete Canciones populares Espanolas. Our hands down favorite was "Asturiana" which she invested with appropriate melancholy. Another fine singer who appears to be well on her way was mezzo-soprano Mariel Reyes from Veracruz, Mexico. So many fine singers seem to be coming from Mexico lately! We enjoyed her performance of Rosa's aria of jealous fury from Jose Serrano's zarzuela Los Claveles--"Que te importa que no venga". Regular readers will recall how fond we are of zarzuela! Ms. Reyes closed the program with a trio of songs by Fernando Obradors, each one exhibiting a diifferent mood and sung with different coloration--the frisky "Tres Morillas", the tenderly romantic "Del cabello mas sutil", and the intense and melodic "El Vito". Ms. Reyes truly knows how to get a song across and held our attention with her intensity. Another singer who possesses this marvelous Latin American sazon is Colombian tenor David Rivera Bozon. The familiar "No puede ser" from Pablo Sorozabal's La Taberna del Puerto was given a highly affecting performance. He also performed a pair of songs by Alberto Ginastera of a rather mournful nature--"Triste" and "La concio del arbol del olvido". Mr. Bozon knows how to get inside a song and make it his own. We couldn't help observing that in the 20th c., when North American songs were being written with impoverished melody, South American composers knew exactly what their audience wanted to hear! And we want to hear it today in the 21st c.! We particularly enjoyed the flirtatious duet performed by Mr. Bozon and soprano Eugenia Forteza --"Caballero del alto plumero" from Frederico Moreno Torroba's zarzuela Luisa Fernanda. Every time we hear a program of arias from zarzuelas, we wish someone would produce one in its entirety. Ms. Forteza is from Argentina and selected a pair of songs composed by her countryman Carlos Guastavino. We particularly loved hearing "Bonita rama", the lovesong of a willow tree. We had another opportunity to hear her singing some of the Manuel de Falla songs. Her performance of "Polo" was riveting in its expression of secret sorrow. We have a couple observations to throw out for singers to consider. One is that the use of a music stand is unacceptable. There were a couple singers whom we decline to name who committed that folly. The consequence is the break of connection with the audience. The performance becomes a private conversation between the singer and the score with the audience "eavesdropping". We have heard every excuse in the book for being on the book. We don't buy it. The singers in question did sing other material without the use of a score and they were much more effective when not glancing down and turning pages. Our second observation is that we got the sense that some of the singers were performing songs they didn't particularly care for or to which they didn't relate. The audience can tell, believe us! We will never forget the take home point we got from a master class given by James Levine with the wonderful mezzo Isabel Leonard participating. The point was "Sing what you love!" Great advice from a great teacher. The fine tenor Hyunho Cho seemed not terribly involved with Tosti's "Malia" but when he sang "Non t'amo piu" he was a different artist completely. He became expansive in his voice and his feelings. We believed in the poet's denial of love and admired the exquisite decrescendo at the end. We also liked the way he sang Joaquin Turina's "Las locas por amor" with a true feeling of fun. As far as songs to love or not love, our personal feelings were that we'd love to hear more of Ermanno Wolf-Ferrari but less of Ottorino Respighi, whose piano writing is lovely (and pianist/coach Lucy Arner surely made the most of it) but whose vocal lines just don't "sing" to us. That Levine interchange was remarkable. Leonard had just sung one of the most beautiful Schubert songs VERY unimpressively. When Levine questioned her about the choice, she said the Horne Foundation dictated it. He asked if she wanted to sing something of her choice and she ran offstage, to return with the music of Falla's 5 Popular Songs. She sang one--exquisitely. We remember it exactly the same way!